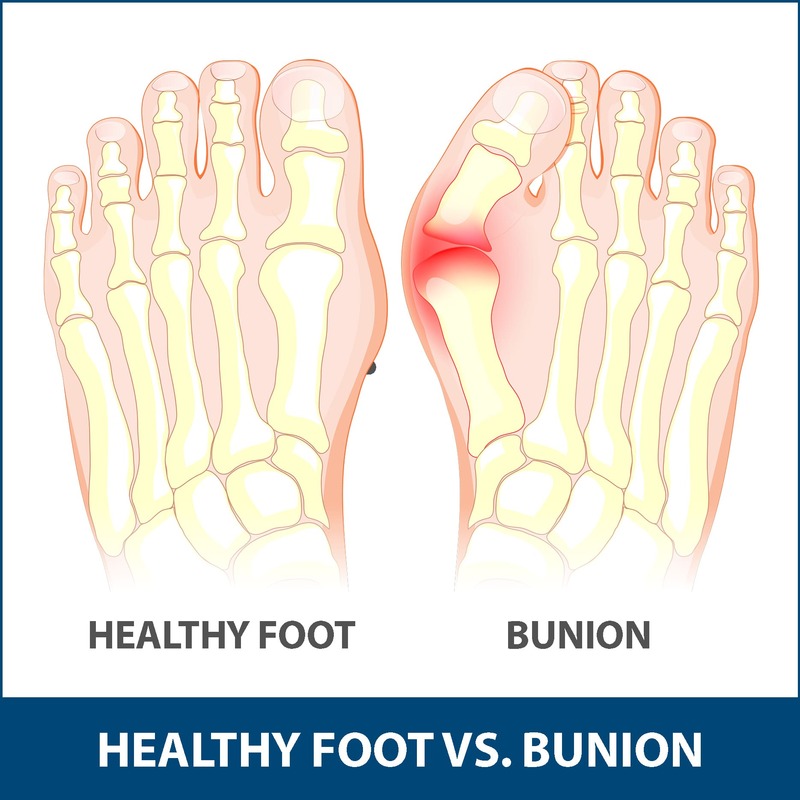 Bunions are painful bony bumps that develop over time on the inside of the foot at the base of the big toe. 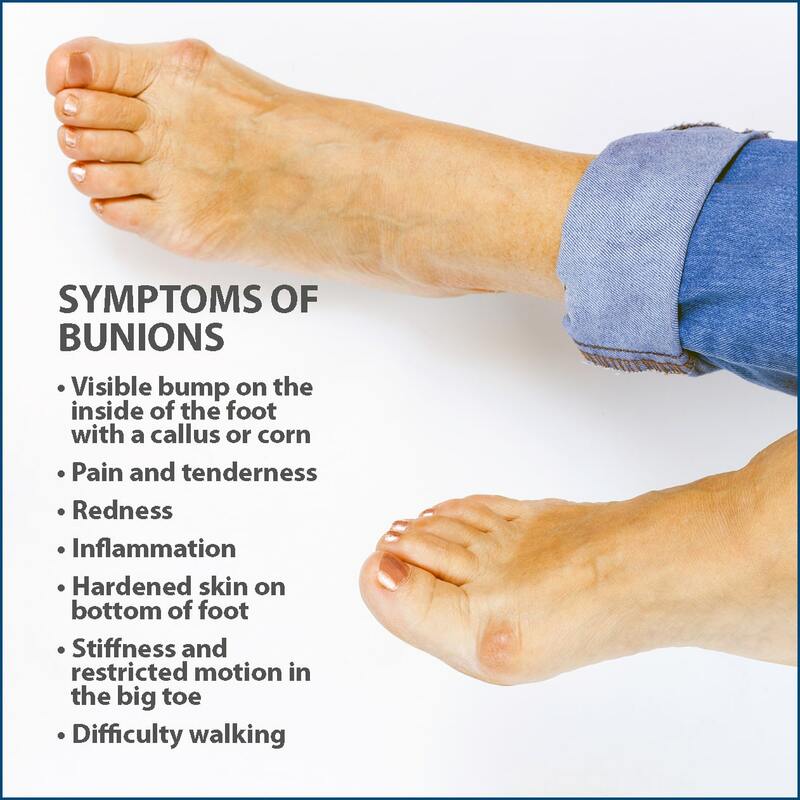 Unfortunately, bunions will not go away without surgery. Non-surgical treatments can sometimes help eliminate symptoms. The big toe consists of two joints: the metatarsophalangeal (MTP) joint and the interphalangeal joint. The interphalangeal joint is located in the middle of the toe. The MTP joint is the largest of the two and is found where the first long bone of the foot (metatarsal) meets the first bone of the toe (phalanx). Footwear. Wearing shoes that force the toes into an unnatural position. Health Condition. Having either an inflammatory condition such as rheumatoid arthritis, or a neuromuscular condition, such as polio. Hereditary. Bunions can be developed hereditarily due to both foot shape and structure. 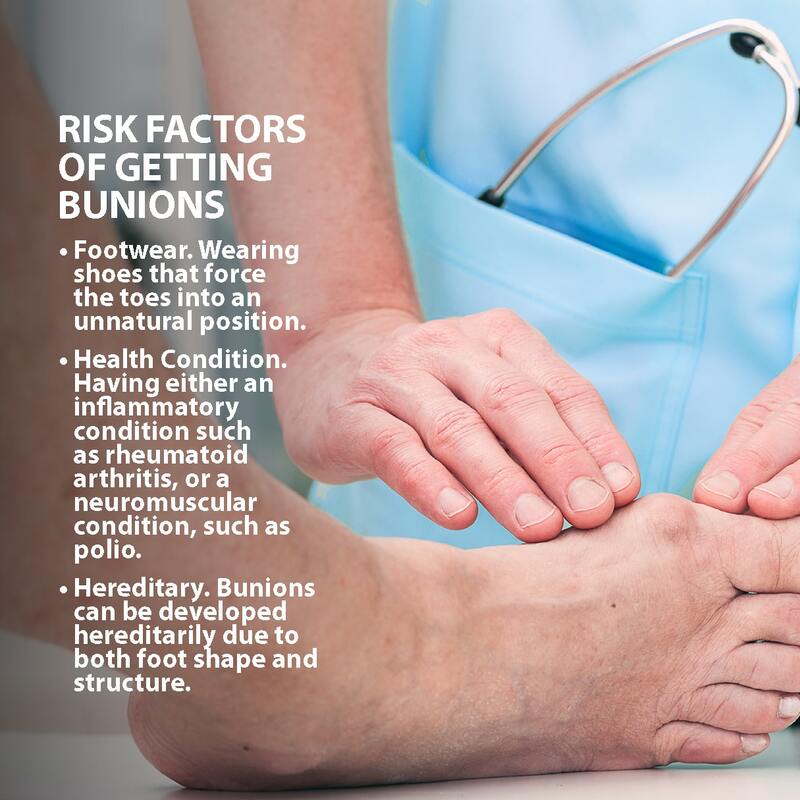 Bunions occur over time and are not an impact injury. Children are also at risk of developing a bunion, but adults are most commonly affected. Bunions that occurs in young people are called adolescent bunions. Your Florida Orthopaedic Institute physician will ask about your symptoms, general health, and medical history and examine your foot. An x-ray will also be ordered to check the alignment of your toes and check for damage to the MTP joint. Since the alignment of the foot changes when you stand or sit, the x-rays will be taken both while sitting and standing. These x-rays will help show your physician how severe your bunion is, and how best to correct it. Unfortunately, bunions can only be removed surgically. But nonsurgical treatments can be used to help reduce symptoms. Surgery is only recommended if nonsurgical treatments are unsuccessful or if the bunion is severe. Ice applied several times a day for 20 minutes at a time can significantly reduce swelling. Nonsteroidal anti-inflammatory medications such as Advil and Motrin (ibuprofen) and Aleve (naproxen) can help reduce pain and swelling. Changing footwear is highly recommended because shoes that do not fit correctly will squeeze your toes and cause pain. Your Florida Orthopaedic Institute physician will give you information on the proper footwear fit for you. Bunion padding can help cushion the painful area of the bunion, decreasing pain. Depending on the severity of your bunion, over-the-counter or custom-made shoe inserts (orthotics), splints, or toe spacers may all be used to help ease pressure on the bunion and reduce pain. Surgery is only necessary if non-surgical treatments were unsuccessful or if the bunion is severe. There are several different surgical procedures used to correct bunions including bunionectomy. 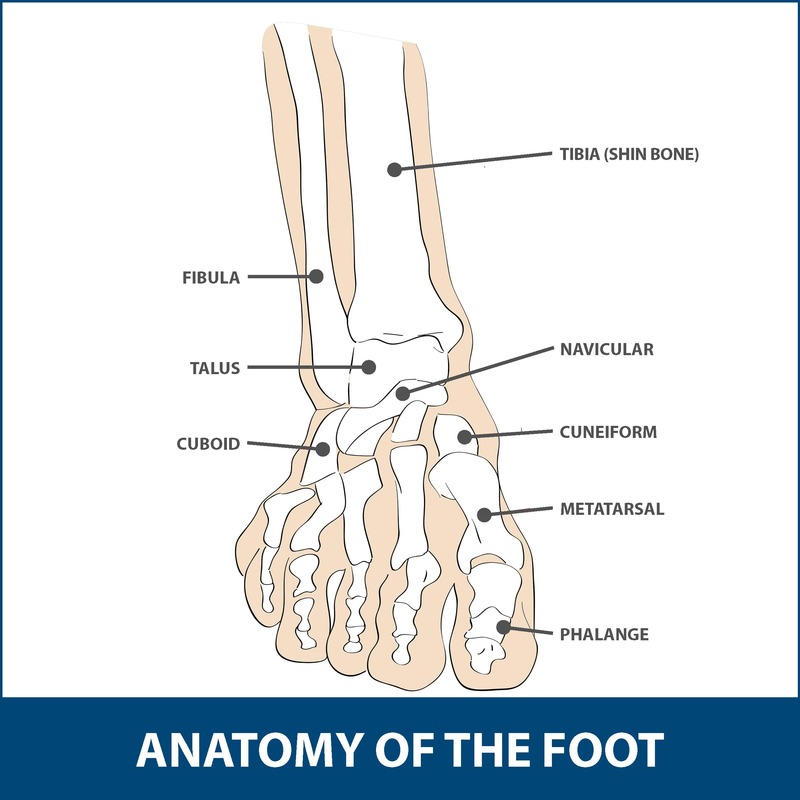 All procedures focus on realigning bone, ligaments, tendons, and nerves which will allow for the big toe to be brought back to its correct position. In the cases of an adolescent bunion, surgery is not recommended because there is a strong chance the bunion will return. Surgery may be recommended if bunion causes extreme pain that does not go away after nonsurgical treatments. After surgery, a surgical boot or cast will need to be worn to protect your foot. A brace will then need to be worn to support the foot during the healing processes. Bunion surgery recovery takes approximately six to eight weeks, but a full recovery can take an average of four to six months. If you are having foot problems and suspect that you have a bunion, schedule an appointment with a Florida Orthopaedic Institute fellowship trained physician.